These classics come from a Land Down Under! We show you some of our favourite Australian Classics from the upcoming Gosford Classic Car Museum Closure! With so many classic cars manufactured right here in our own backyard, Australia certainly has its fair share of petrolheads and classic enthusiasts! Of course, the largest privately-owned classic car collection ever to be auctioned in the southern hemisphere is going to feature some true blue Aussie classics. Over 20 of them in fact! This is a rare opportunity to see a collection of iconic names together like Ford, Holden, Mazda and Chrysler. We have chosen five of our favourites as a taster of what’s to come in this incredible auction. This is considered one of the collection’s most 70’s muscle cars! One of only 149 built and sold, this beauty is extremely rare! Despite having a six cylinder engine, the Chrysler Charger R/T E49 is lighter and quicker than a Ford Falcon GTHO Phase III! The drive is smooth and torquey, providing the raw and connected feel that these cars have become so well known for. It really was born to race! Not only is it deemed to be the best car never to win at Bathurst, this Charger also sports striking good looks. This particular car has been beautifully restored in its original Mercury Silver paint and features the correct decals and striping. The original black interior is unrestored and still has its genuine aluminium steering wheel! XBs were the last of the GT era but were the most prolific! Only 949 hardtop sedans were built between July 1973 and June 1976. The ‘65 Cortina GT 500 became the first purpose-built car to win the renowned Bathurst 1000 km road-race and set the stage for the next 6 consecutive models ending with the XB. The XB model still had plenty of go too, thanks to a 300hp, 750 Holley-equipped 351 Cleveland V8 engine paired with a four-speed top loader manual transmission. This particular XB is one of only 8 cars ever built in the Tango Orange colour scheme which certainly makes it a head turner! This matching numbers car has had a full restoration including paint and interior refurbishment, and Driveline reconditioning. This car is certainly a fantastic example of grand tourer in every sense of the term and a rare collectable classic! 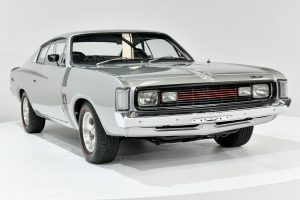 The first Brock Commodore was based on the VC model and came about as a direct result of Holden’s official withdrawal from motorsport in 1979, leaving Peter Brock without a sponsor. A plan was then hatched. Holden would ship new VC SLE Commodores to HDT where they would be transformed into high performance road cars and sold through 57 carefully selected dealers in order to fund Brock’s racing. Using the SLE VC model as a base means this HDT Commodore features luxury features like air conditioning, power steering, electric windows, and four-wheel disc brakes. The hit success of the VC Commodore made for a bright future for HDT. This car is number 348 of only 500 VC “Brock” Commodores ever produced and boasts the highly desirable colour combination of Palais White over a red velour interior. Sold brand new in Wollongong, this stunner comes with a history file containing upgrade documentation from HDT and previous ownership history. The HSV Maloo ute was responsible for changing the way we looked at utes forever. These vehicles combine the peak in performance technology and feature torque vectoring, lightweight forged 6-piston brakes, launch control and a bi-modal exhaust. Only 250 limited edition Maloos were built (and 10 were shipped across the ditch to New Zealand), making them an instant collectable. This beast is number 175. But what makes this car extremely special is that it only has 110kms on the clock! Yes, you read that correct… 110 kilometres! This rare manual car is in immaculate, as new condition and all the original factory books remain with the car, including factory spare keys! There seems to be a big future in collecting utes, particularly now Holden are not making their ‘traditional’ utes anymore. This is an excellent opportunity to own one of the rarest and one of the last Australian-built Holden Special vehicles every produced. The Nismo GTR is the most extreme sports production car Nissan have ever built and is easily one of the fastest cars in the world! This car also displays an unbelievably low odometer! With only 104km on the clock, the interior is still protected by plastic and all factory books and spare keys come with the car, making practically brand new. The 3.8L twin-turbo V6 produces 441kW and sends this car from 0-100km/h in just 2.7 seconds! Featuring forged RAYS wheels, Brembo calipers, factory Recaro seats, air-conditioning and a Bose sound system, this car has all the bells and whistles. The production run of these cars is extremely limited, making this a rare opportunity to own Nissan’s fastest street-legal vehicle. If you want to keep up to date with all our unbelievable Classic Car auctions then simply pop your email address below and we will send notifications directly to your inbox!